Posts: 1434 Changes are being made to the way tickets for next year's Glastonbury Festival are sold in a bid to attract younger fans. 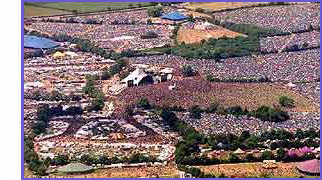 Organiser Michael Eavis told BBC Somerset Sound that about 40% would go to people who book over the telephone. The move is aimed at attracting more 16 to 18-year-olds who have mobile phones but might not have fast internet connections. Tickets for this year's event sold out over the internet in 1hr 45 minutes. Mr Eavis said this year's Glastonbury was noticeably short of about 30,000 to 40,000 young people as older people with faster internet access had bought up the tickets. "The problem with the clientele at the moment is that they're becoming a bit older and a bit more clever and they've got the gear to buy the tickets as they have fast access to the ticket system and can buy more", he said. "These people are perfectly nice and adorable, but we want the late teens because they help to make the character of the festival so it's really important to get them on board." He said teenagers were "spunky" and had a lot to offer and that was how it always used to be. "The ticket people aren't going to like it because it'll be a lot more difficult for them but we have to do it, it's absolutely essential," he said. Posts: 1434 So there you go, Glastonbury is too old and middle-class, official! I agree with him in regards the festival being a bit lacking of teenagers & being too middle-class, but this isn't going to help & if anything will make things worse. Dropping the price & putting on bands that will get the sort of Kids Eavis wants will help. Unfortunately for him there is a festival that does just that in Reading. I don't think this is going to make a blind bit of difference to the demographic of the festival.